Missiles have been thrown at police in Dublin as people protesting against water charges attempted to break through a barrier. Thousands of people attended the protest in the city centre. The missiles were thrown at police on Kildare Street, where they were reinforcing a barrier to prevent protesters breaking through. An officer sustained an eye injury and was treated at the scene. Traffic restrictions had been put in place in the city centre ahead of the demonstration. Feeder marches converged at the main stage on the junction of Merrion Square South and Merrion Square West. Earlier a man was arrested for what police described as a minor public order offence. It is understood the incident took place at the bottom of Kildare Street. Kildare Street is sealed at the Nassau Street and Stephen's Green entrance as well as the Molesworth Street entrance. Police with riot shields and helmets are in attendance. Last month, the Irish government revised its plans for the introduction of domestic water charges, a key austerity measure. 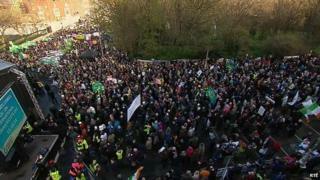 Media captionThousands of people are attended protests in Dublin and Cork, as Shane Harrison reports. The Fine Gael-Labour coalition has faced major protests over the issue. Environment Minister Alan Kelly said charges would be capped at 160 euros (£128) for single adult households and 260 euros (£208) for others. Water conservation grants of 100 euros a year (£80) mean the effective costs will be 60 euros (£48) and 160 euros (£128) respectively. The starting date is 1 January, with the first bills to be issued in April. Mr Kelly said on Wednesday that he did not envisage any change in the Irish government's policy on water charges. He said he had not seen a realistic alternative from the Opposition on how they will pay "the billions" needed to improve water infrastructure. Members of the Detroit Water Brigade, will visit Cobh in County Cork on Thursday, where an anti-water meter campaign is continuing. Thousands have been sharing songs and videos online to protest against the introduction of water charges.